Go to Sign In-Out --> Student Attendance. Click the ellipsis (...) on the line with the child's name (if signing out multiple children use Option C below) and choose "Edit." Add a sign-out time, who signed the child out, and click "Save Changes." 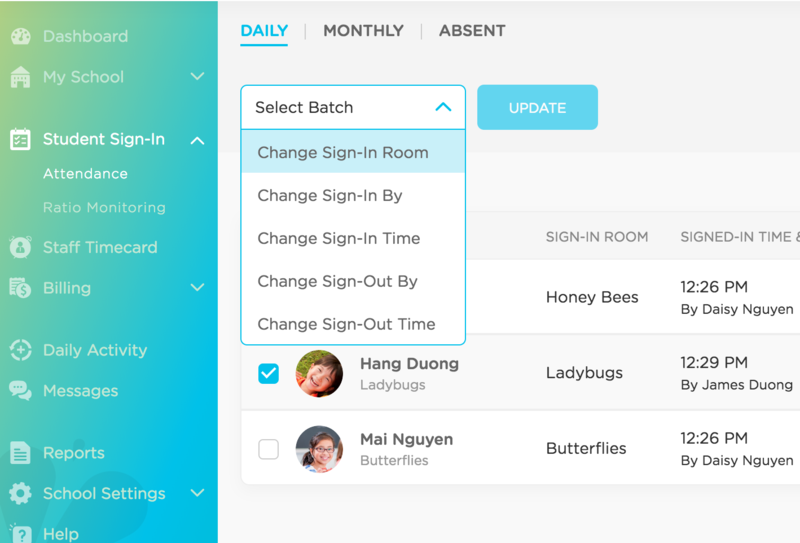 Click on "Create Sign-In" button at the top right of the page and choose "Sign-In Attendance" or "Sign-Out Attendance"
Select the child(ren) and click Continue. Select the room, person who signed them in/out, and the time. Click "Sign In." Follow directions in Option A above to add the Sign-Out time. Check the box next to the student's names. Use the Select Batch drop-down menu to update the room, person, or time for the student's sign in or out entry. Click the ellipsis (...) on theq line with the child's name and choose "Delete."